Prompt: Write about your experiences with social networking tools for genealogy purposes. Do you use MySpace, Facebook or Twitter? Are you a wiki kind of person? None of the above? Tell readers about your experiences with these tools and watch your own social network grow. As I’ve stated before, I got into blogging and Facebook through Miriam’s blog AnceStories: The Stories of My Ancestors. I had wondered about starting a blog for genealogy, so I Googled genealogy +blog to see if there were other people blogging about their genealogy. Sure enough, I found a few and Miriam’s was one of the ones I started reading. She also had a badge for the GeneaBloggers group on Facebook, so I decided to check it out. I had a FB account prior to this, but really didn’t use it. But since discovering Miriam’s blog and the GeneaBloggers group, I’ve used FB to connect with over 400 other individuals interested in genealogy (as well as friends, family, and colleagues). I’d say that I interact with about 50 of these folks on a regular basis. There have been a few instances where I have had a question about something and I get on FB to see if someone is logged on that may be able to help. Within minutes, I have an answer! It’s nice to have this network in place for these occasions. It’s also wonderful because I learn so much from these folks through FB and their blogs. Additionally, I have met distant cousins through FB and our blogs. Without these tools, I never would have met these wonderful people!! Several months ago, I got involved with Twitter. I have to admit though, I don’t really care for it. I think it’s hard to follow conversations and interact with others. I truly prefer FB for conversation and interaction. I do have my blog posts automatically tweeted, simply as a means to reach a broader audience and those who don’t use an RSS reader. Like many who read this blog, I recently joined Genealogy Wise, which is like FB for genealogists. I have mixed feelings about it. For one, agreeing with Bill West, it’s just one more place I have to go and participate in. 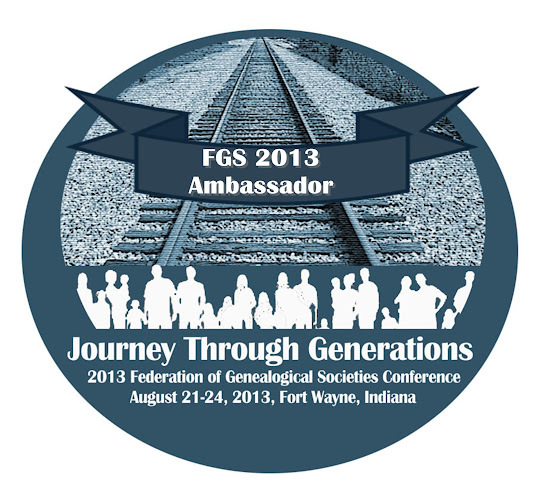 But on the other hand, it is a network strictly for genealogists (10,000 and counting, in just over a month! ), so there is certainly a lot of potential. This last month has been really busy for me and I haven’t really been able to spend much time here, so the jury’s still out. And then there is this blog. I am able to post whatever I want, and I have a faithful following. I can post a research problem and people are kind enough to offer help. Even for the routine-type posts, such as Wordless Wednesday, the comments I get offer encouragement and keep me going, both in blogging and in genealogy. I want to take a moment and thank all of my genealogy buddies across the web, whether via Facebook, Twitter, Genealogy Wise, or this blog. You are all wonderful people and I don’t think I could have gotten this far and learned as much as I have in the last 366 days. And for those that I am not buddies with on FB, Twitter, or GW, I’ve listed the links to my profiles below, so feel free to friend or follow me.